I had no idea what Cascioni Romganoli was either. 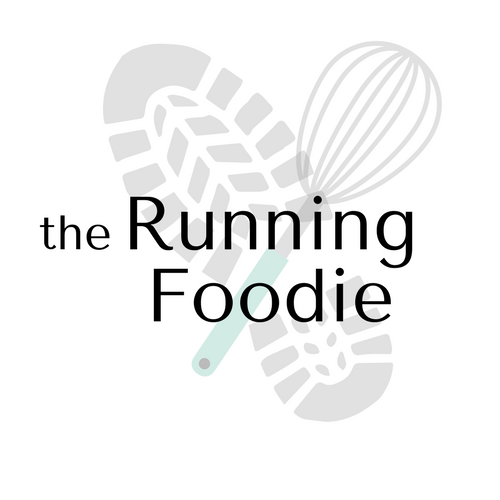 When I saw this recipe over at Food52, I was intrigued. 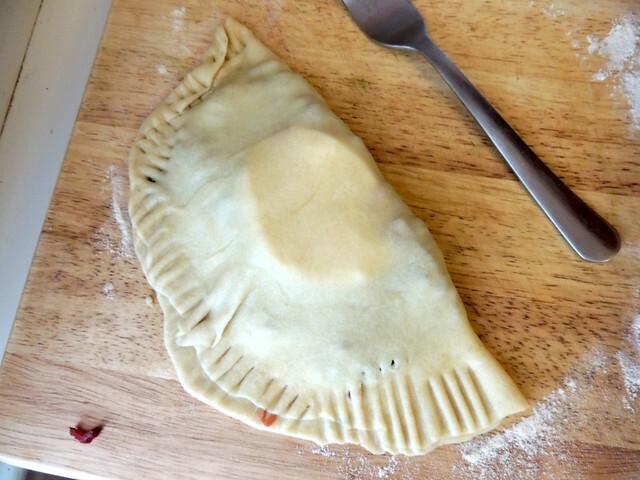 Cascioni Romganoli is essentially a savory turnover, and turnovers are great for lunch meals or snacking with one hand since the messy filling is neatly contained in a sealed pocket of dough. 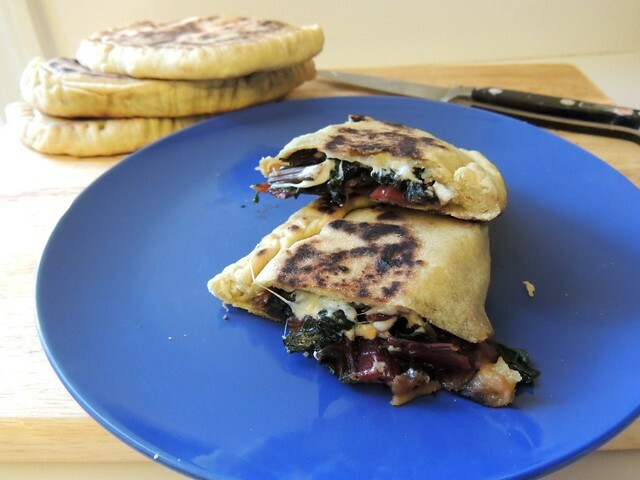 The author says that her mother would use leftover piadina (a flat bread from Romagna), and stuff them whatever ingredients were on hand to make stuffed dough pockets that are cooked on the griddle. 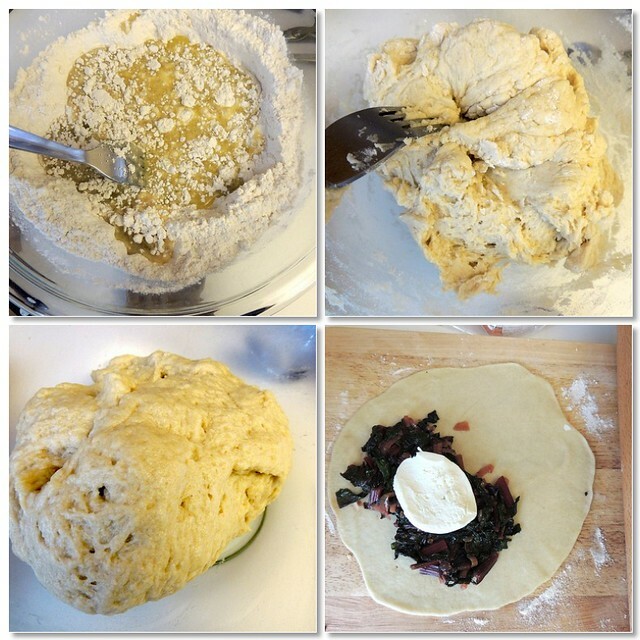 Begin by creating a simple dough enriched with olive oil. More traditional doughs are made with lard, though the author of this recipe chose olive oil as it makes working with the dough easier. After mixing and kneading lightly, my dough was rather spongy and oily, and I wondered if it would even be able to roll out. I had to sprinkle the dough, board, and rolling pin with flour, which wasn't suggested in the recipe, but it got the job done. 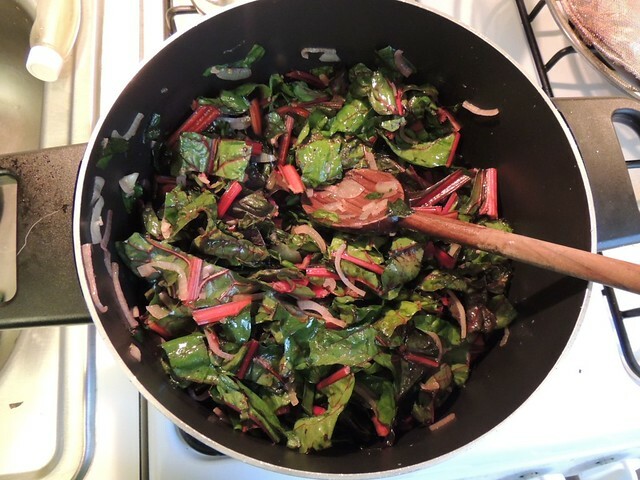 I wasn't sure whether or not to use the stems of the chard. 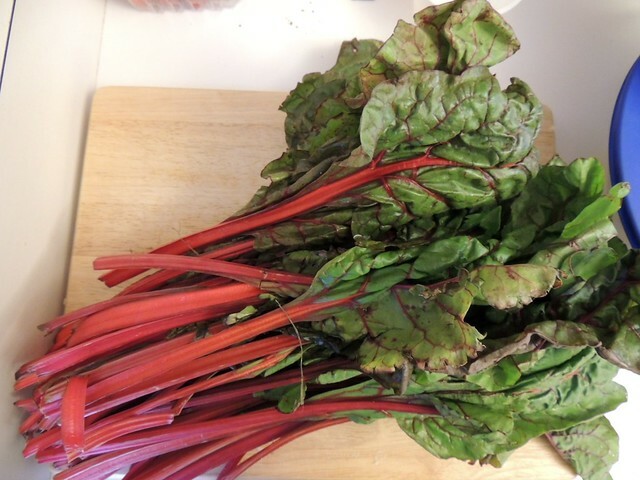 Since the recipe didn't specify, I went ahead and added the chopped stems to the pot. They tasted fine and all and cooked thoroughly, but the pieces poked through the thinly rolled out dough (should have seen that coming). Next time, I'll keep them out. 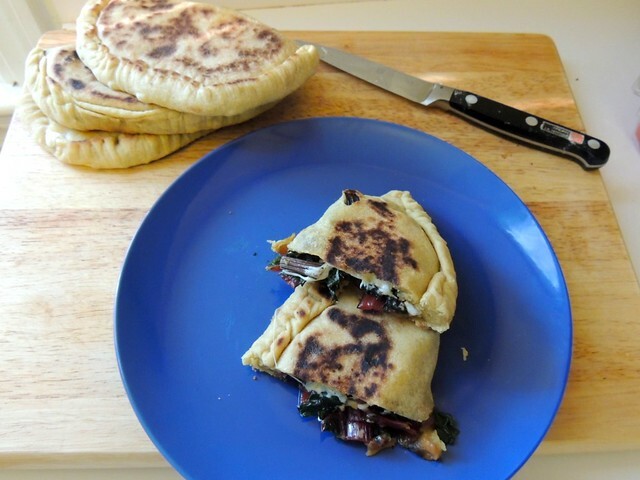 The turnovers are supposed to be filled with either the cooked Swiss chard, or with a fresh mozzarella/tomato mixture; I combined the chard with the cheese and didn't bother with the tomatoes. As a result, there wasn't enough filling for all twelve turnovers, so I stuffed the remaining two with cheese. Tasty cheese. 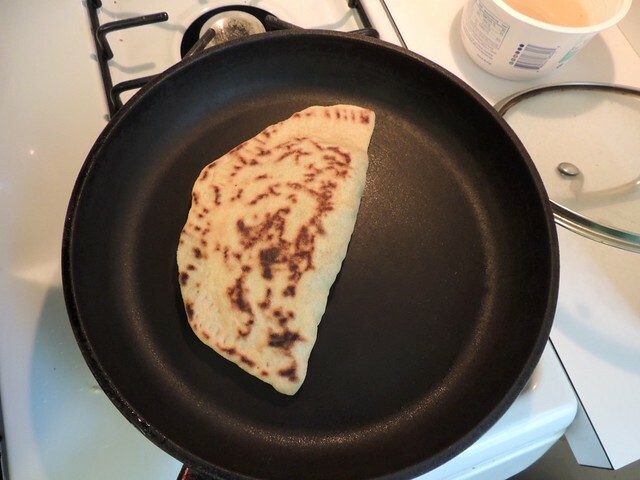 These turnovers are cooked in a skillet on the stove rather than baked. I fell into a methodical rhythm of working on forming a turnover while another one baked since I lacked the counter space to form them all before baking. Typically, when I make something this labor-intensive for dinner, I end up wondering what I was thinking. The results exceeded my expectations in this case, and while I wasn't sure if I made the dough correctly, I was glad I did it. The crust wasn't too oily after cooking and it holds up to the filling better than I thought. The remaining turnovers were individually wrapped in plastic wrap and frozen for another day. The 'more you know' rainbow would be apropos right about now! I hate hate hot pockets, but I do love these!